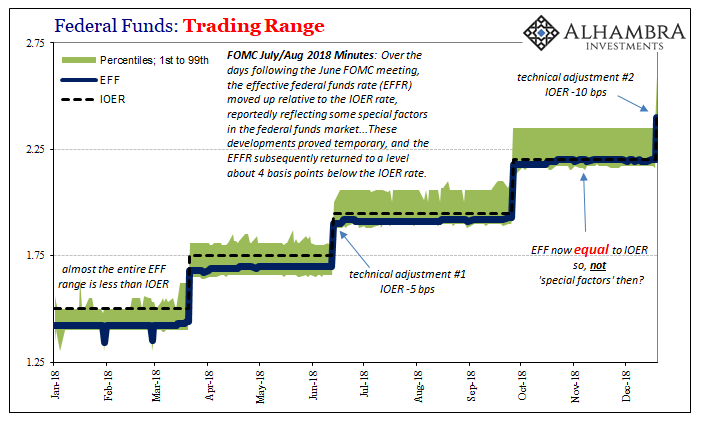 Setting the interest rate paid on required and excess reserve balances 10 basis points below the top of the target range for the federal funds rate is intended to foster trading in the federal funds market at rates well within the FOMC’s target range. The attachment and attention to federal funds is itself a backward project. Things don’t start there, they might end up there when the global reserve currency system spins enough out of control. But that doesn’t matter to these monetary theorists who haven’t the slightest way to discern modern money; which is why they can’t get this right. What matters to the current suite of policymakers is the illusion of control, therefore they cannot tolerate the effective federal funds rate betraying their arbitrary policy settings – even if the market itself doesn’t care one bit about federal funds. IOER itself is not arbitrary, it is a real thing an actual transaction. The role of that transaction within the system as it truly operates isn’t what Economists think. Thus, the charade. The real problem resides outside all this, meaning technical adjustments are now like “rate cuts.” They are given meaning they can’t actually achieve because the shadow money world is hidden and complex and therefore everyone just defers to Fed officials since they sometimes sound like they are doing something substantial. The illusion. What should capture the world’s attention is that they feel compelled to do something at all. If it actually was monetary policy, they wouldn’t need to do it twice (or the first time, for that matter). It’s all the rest which counts, meaning all the stuff (below) completely ignoring technical adjustments, the federal funds range, and most of all this inflationary recovery fairy tale.